Councillors will be asked to decide on two retrospective planning applications relating to an unauthorised Gypsy/Traveller site near St Cyrus next week (April 30). Two applications have been received for a change of use of agricultural land beside Eskview Farm, to the south of St Cyrus and near the National Nature Reserve. One relates to the creation of a permanent halting site, the other to a site for touring gypsies/travellers, both part of the same compound. 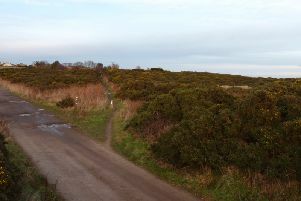 The site, which currently houses a number of caravans and Gypsy/Travellers, forms part of the functional flood plain of the nearby River North Esk. Members of the Kincardine and Mearns Area Committee were recently asked for their views, prior to the consideration of the applications by all councillors. Local councillors supported the recommendations of officers to refuse both applications, while asking that further account be taken of potential impacts in relation to the safety risks of residents remaining on the site. The first application seeks full planning permission for retrospective change of use of agricultural land to form an eight stance caravan park, the formation of a road, recycling point, bund and boundary fencing. The second seeks full planning permission for a retrospective change of use of agricultural land to a site for touring gypsies/travellers, the erection of two stances, a toilet block, washroom, pump station and recycling point, the formation of a road, a bund and boundary fencing. Drainage covering both sites has been designed for up to 120 people. Representations have been made for both applications, both supporting and objecting to the developments. Extensive consultation with council services and external agencies is outlined for councillors, including an objection in principle from Sepa on the basis of flood risk. Planning officers are asking the Full Council to support their recommendation that both applications be refused. In the report they outline a range of reasons for refusal and the implications of that. The development to which the applications relate started in September 2013 without the benefit of planning permission. A temporary Stop Notice was issued and Interdict granted at Stonehaven Sheriff Court, but work continued on site. Two retrospective planning applications were submitted in September and November 2013, but these were withdrawn prior to determination.